This tutorial was written on May 24, 2009 by Shani aka Wicked Princess. The concept of the tag is mine and mine alone. Any resemblance to any other tag/tut is pure coincidence. This was written for those with working knowledge of PSP. Add a new raster layer and move to the bottom. Flood fill with your choice of paper and add the mask. Don’t forget to merge the group. Go to your plug ins and choose Xero Fritillary and use the random setting of your choosing. Next go to the bottom template layer and go to selections, select all, then float, selections defloat. Don’t forget to go to selections, none then delete the template layer. Add a gradient glow on the fat setting with the color black. Repeat this process for the rest of the template. Open your choice of doodle, and resize as needed. Copy and paste as a new layer, moving it to the layer just above the mask one. Move the doodle to the left, top side. Duplicate this layer then go to image, mirror. Close off all layers but the two doodle layers. Merge visible, and duplicate that new layer. Merge visible again. Open all layers back up. Next open the bow of choice, resizing and copy and paste in the middle of the canvas. Using your Muera Meister Plug ins, choose the encircle setting. I believed I set the x and y to 70. Change to the amount of bows you want. Whatever will look ok to you. Once happy, move this layer to the one just above the large circle layer. Open the flower of choice, and resize as needed. Copy and paste as a new layer, and use the Copies plug in again. Repeat what you did before, but changing the x and y to 50. Adjust the number of flowers to your liking. Adjust and move as needed. Move this layer to just below the top circle layer. Choose one of the heart elements you like, resize and adjust as you like. Copy and paste as a new layer, placing to the top left of the circles. Add the bow of choice, and the tag of choice. Open your tube, resize if needed and copy and paste as a new layer to the right of the canvas on the top layer. 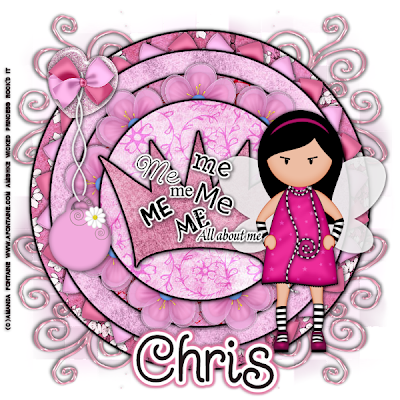 Add the It’s all about me word art, and add a gradient glow. Add your artist info, license info, tagger markings.